Making your battles look a little more special isn´t always an easy task. Getting the right balance between the scenery and buildings takes a long time to get the hang of. Too much scenery and the table looks messy and cluttered, too little and you run the risk of your troops having little or no cover to advance behind. There are a good many different additions available from the wide variety of companies that make up games industry, and very recently Target Games joined the list with the release of the first of their own battlefield enhancers. The Brotherhood Cathedral (reviewed this month) and the Bauhaus Bunker are the first two releases for the Warzone/Dark Eden ranges and out this month for their fantasy system Chronopia is the Firstborn Watchtower. The Watchtower is a huge affair when assembled and will make an excellent centre piece to any battlefield. Coming flat packed in an attractive slimline box, not only is it impressive to look at, it is also practical as the very detailed rules supplied in the form of a black and white booklet give one everything needed to know when fighting both in and out of buildings. Combat in buildings as always been something of an hit or miss affair, but Target’s hard working design crew seem to have more than managed. I will go into the rules in more depth in a moment but first onto the building itself. The Watchtower is made up from 8 pre-printed card stock sheets with artwork by Targets resident genius Adrian Smith. Adrian has done a great job with the basic paint work, based on a design by Phil ‘Mr Nice Guy’ Lewis and more than manages to capture the feeling of the isolation of the Watchtower. Once assembled the whole tower is a huge affair and will look great in the centre of a battlefield. The first job is to very carefully cut out all the pieces of the building before assembly. I would suggest that you follow the instructions very closely when doing so and as always with sharp objects treat the knife with great care and respect. My only gripe with this and the Brotherhood Cathedral is that although the painting is flautles the basic premise is not. The card in both cases isn´t pre-cut or scored and this could cause a few problems if one was to slip with a scalpel or craft knife. But if you do take care you shouldn’t have any troubles really. Following the rules I carefully cut each piece out of the cardboard, marked them with the relevant number and laid them aside for assembly. The instructions suggest that you use a clear adhesive so that you can position your pieces without having to worry about it drying to quickly. I choose to use PVA glue for the assembly of my sample as its easy to use and still dries quite quickly. Matching up all the pieces and taking my time, I used an old size 4 paint brush I keep for such occasions and within an hour the whole building was constructed and only needed to have the high roof placed on it. The instructions inform you that you may need to touch up parts of the model once you have assembled it and I found that this was the case in my sample. Once all the parts are cut out and ready to put together the task of scoring the various folds and edges that need bending is the next job in hand. This is a very tedious task and takes a long time to finish as you have to be very careful not to use too much pressure on the scoring or you will end up cutting right through the card itself. And this is the biggest flaw. Here we have an excellent product that is let down by the simple fact that the card sections are not pre-cut or scored. I can foresee many people (especially those younger gamers) finding the whole thing something of a chore rather than simple. I have many years experience with building models including the card variety and it took me over an hour to cut out all the parts and almost 20 minutes to put the building together. The low price of the supplement is very tempting but I for one would pay a few pounds more to get a pre-cut affair. Once assembled however the whole tower is a huge affair and will look great in the centre of a battlefield. On to the rules. We have a very clear and concise set of rules that detail fighting inside buildings. 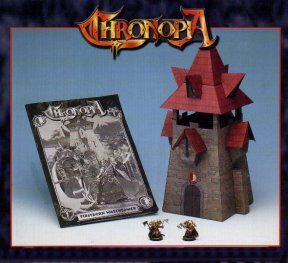 The rules were designed with Chronopia in mind but with very little work could be used in Warzone or even Warhammer or one of the other systems around at the moment. Set out very well with some nice black and white photographs, the book looks very nice and the added fiction from Peter Flannery gives it a little more weight. The Watchtower comes with two miniatures that are only available in this set, The Enlightened is for the Firstborn and the Stalker is for the forces of the Devout. Both miniatures look excellent and full rules for them are given along with a complete scenario that allows one to use you’re new tower. 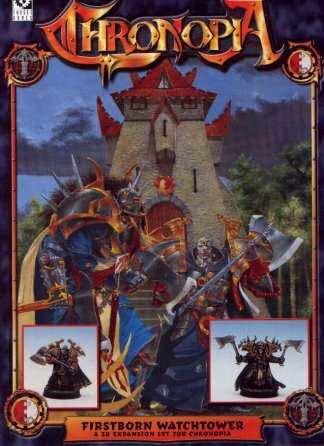 Overall the price of the set is a very tempting prospect and for the money you do receive good value, but if the card was as stated above then this would be one of the best pieces of terrain available from any games company. First version from 24.03.2008. Last Version from 24.03.2008.